"The Temporary Protection Visa policy has created an unjust two-tiered system for refugees and has caused undue suffering and distress for many people trying to escape persecution"
That's the voice of Human Rights Commissioner Graeme Innes. "I congratulate the government for ending this heartless policy and giving refugees and their families permanent protection at last." On the second Tuesday of May 2008 Labor's first Federal Budget came, and with it came provisions to end the Temporary Protection Visa, cruelly introduced by John Howard to stave off political challenges posed by right-wing nationalist-populist politician Pauline Hanson. "...all right, we admit you're a refugee for now, but if you can't stand the immense pain of your wife and children living away from you on the other side of the world, you can bugger off, because you will loose your visa if you dare to leave our country to remind yourself of your wife or children - no exceptions, even if they are all dying, or if your wife becomes interested in another man, because you abandoned them and came to Australia. And no matter whether your children may think that you have abandoned them or grow up to not even recognise you if you would meet them somewhere on this planet in the future." This page is a collection of news items related to the abolition of Temporary Protection Visas - the first impression. While we know that there are other serious problems with Labor and its position to refugees and asylum seekers, we warmly congratulate the Rudd government with this policy step. THE terror of fleeing the Taliban and ethnic cleansing in Afghanistan, a hair-raising journey in a rickety boat and three years of detention on Nauru is more than anyone should have to endure. But even after asylum seekers such as Mohammad Dawlat-Hussain were found to be genuine refugees, the former government sought to punish them for another five years, Immigration Minister Chris Evans said yesterday. Mr Dawlat-Hussain, whose boat reached Ashmore Reef in 2001, is one of almost 1000 refugees who will be granted permanent residency within months of the Government's abolition of the controversial temporary protection visa. "I just heard it this morning and it is lifting a lot of weight from me because it used to be very time-consuming and stressful to apply for permanent residency," he said. "Now this policy has changed, which is (giving me the) feeling we are finally welcome in Australia." Under the former government, refugees were forced to reapply for protection several years after being granted temporary visas, in case the conditions in their home countries had changed. While on temporary visas they had no travel rights, reduced access to resettlement services, English language programs, employment and income assistance and could not sponsor or be reunited with other family members. Psychologists and refugee advocates said the uncertainty of their future and anxiety they would be returned home led to severe mental-health problems. Mr Dawlat-Hussain's sister and her three young children, who were also in Australia, had not been able to see their husband and father for seven years under the visa conditions. Opposition Immigration spokesman Chris Ellison said the abolition of temporary visas sent a clear message to people smugglers that Australia's borders were open for business. 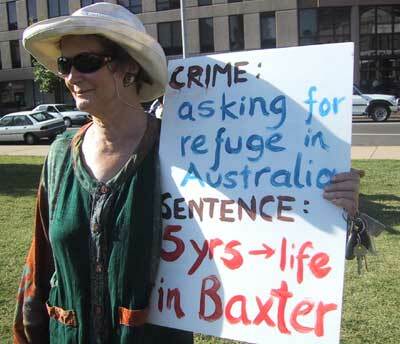 "Government agencies are doing a very good job in defending Australia's borders. However, the statement by the Government, that regardless of their mode of arrival people will receive a permanent visa if they are found to be refugees, undermines this good work," Senator Ellison said. But Senator Evans said the temporary protection visas did nothing to prevent unauthorised arrivals. And he said that despite the former government's rhetoric, of the 11,000 temporary visas granted, 9800 had eventually progressed to permanent visas. Senator Evans said that while mandatory detention would remain, the Government was keen to resolve people's immigration status much more quickly. However, he is yet to announce the resolution of the cases of 61 people who have been in detention for more than two years, despite setting himself an April deadline. But Opposition immigration spokesman Chris Ellison said dropping the TPVs sent a "clear message to people smugglers that Australia's borders are open for business". Canberra: Australia has told the United States it will no longer honor a deal to swap refugees who attempt to reach the two countries by boat, the Australian immigration minister said Thursday. The informal agreement was reached a year ago so that the two allies could refuse to accept such asylum seekers. But no refugee has ever been transferred under the deal, and Australia's new government has changed policy on the issue. When the deal was struck, around 90 asylum seekers, Sri Lankans and Burmese, who were being held at an Australian-run immigration detention camp on the Pacific island nation of Nauru were eligible to be resettled in the United States, if they qualified as genuine refugees. Australia, in turn, agreed to resettle 200 Cubans and Haitians annually from asylum seekers intercepted at sea while trying to reach the United States and held at the U.S. Navy base at Guantanamo Bay, Cuba. Immigration Minister Chris Evans said Thursday that Washington had been told that the deal was scrapped after his government came to power in elections last November. He did not say when the United States was notified. Australia was no longer prepared to accept refugees held by the U.S. at Guantanamo Bay, he said. Prime Minister Kevin Rudd has dismantled the previous government's policy of sending asylum seekers intercepted at sea to island detention camps to wait for years until another country agreed to accept them. Evans said the deal with Washington was part of former Prime Minister John Howard's plan to prevent these refugees from ever reaching the Australian mainland. However, most have since been resettled in Australia and the islands camps closed. The deal had been widely criticized by human rights groups. Doubts were raised about whether presenting Australia as a backdoor to the world's richest nation would deter asylum seekers from journeying into Australian waters by boat. An official at the U.S. Embassy in Canberra said Thursday she could not immediately comment. Human Rights Commissioner, Graeme Innes has welcomed the announcement in last night's Federal Budget of the abolition of the Temporary Protection Visa (TPV) system for refugees. "The Temporary Protection Visa policy has created an unjust two-tiered system for refugees and has caused undue suffering and distress for many people trying to escape persecution," said Commissioner Innes. Under the TPV system, which was introduced by the Howard Government in 1999, refugees who arrive in Australia without a visa are only granted a three-year TPV in the first instance. This contrasts with the permanent protection visas granted to refugees who have applied from outside Australia. The temporary nature of the visa condemns refugees and their families to an uncertain future. This compounds the impact of trauma and suffering which has already been experienced by many TPV holders prior to their arrival in Australia. "TPV holders have no rights to family reunion and are effectively unable to leave the country for the duration of their visa," said Commissioner Innes. "This has meant that many refugees have been separated from their families for indefinite periods of time." The budget also contained the announcement that existing and former holders of a TPV who are still in Australia will have access to a non protection permanent visa, with the same benefits and entitlements of the Permanent Protection visa, and without the need for a reassessment of protection obligations. "It is only right that these individuals and families will now be given permanent visas," said Commissioner Innes. "I hope that they can make a new life for themselves in Australia without fear for their safety and future hanging over their heads." The Human Rights and Equal Opportunity Commission's National Inquiry into Children in Immigration Detention, A last resort? in 2004, highlighted the terrible impact of TPVs on refugee children. HREOC found that the lack of family reunion rights combined with inability to leave the country breached the human rights of refugee children. Democrat Senator Andrew Bartlett has praised the Budget measures to expand our migration and humanitarian programs and to confirm Labor's promise to abolish the harsh and ineffective Temporary Protection Visa. "The nation building role that migration plays is often overlooked in political debate, but it is more crucial than ever at this time, given some of the major economic pressures Australia currently faces," Senator Bartlett says. "The increase in the family and humanitarian intakes, alongside more permanent places for skilled migrants makes the migration program more balanced." "However, there still needs to be more settlement support provided to all new arrivals." Senator Bartlett gave special praise to the scrapping of Temporary Protection Visas. "It should never be forgotten that Labor supported John Howard to introduce this visa, which history has proved to have been cruel, counter-productive and ineffective, as the Democrats warned it would be when we attempted to stop its passage through the Senate in November 1999. But equally, Labor's willingness to scrap the visa should be praised." "It will enable many current and future refugees to be able to fully contribute to the Australian community and economy, as so many have done in the past to the great benefit of our nation." AUSTRALIA'S annual refugee intake will be increased by 500 in today's federal budget, with more focus on Iraq and the persecuted Karen people, a Burmese ethnic minority. The Government is also expected to outline its longstanding pledge to abolish temporary protection visas. The system - which requires refugees to have their asylum cases reassessed after several years - is contentious, with psychologists claiming it extends refugees' trauma by giving them no certainty. Under the policy, temporary protection visa holders are unable to sponsor their families or visit overseas. When in opposition, former immigration spokesman Tony Burke even linked the drowning of 300 asylum seekers on the SIEV-X to temporary visas. He said the majority of children on the boat had fathers who had been granted temporary protection in Australia, but were then unable to sponsor their families. The Age believes Australia's humanitarian program will increase to 13,500 refugees in 2008-09 after remaining at 13,000 for the past two years. The nation's overall migration program has jumped from 74,000 to 158,000 in 11 years, but the humanitarian intake has only increased from 9886 to 13,000. The program became mired in controversy last year when former immigration minister Kevin Andrews was accused of playing "ugly race politics" after he claimed the refugee intake from African countries such as Sudan had been cut amid fears they were failing to integrate. Despite the conflict in Darfur, the former government allocated 30% of refugee places to Africans this financial year, down from 70% in 2004-05. In 2007-08, 35% of the intake was from the Middle East and 35% from Asia. The Age believes the African component will remain about the same, while this year's intake will focus more on Iraqi and Karen refugees. WHEN former immigration minister Kevin Andrews sparked a race row over his claims that African refugees were engaged in crime and failing to integrate into Australia he was acting contrary to advice from his own department. In a confidential briefing to the minister, obtained by The Age, the Immigration Department stressed that studies suggested it was not ethnicity that determined criminal behaviour but a combination of socio-economic problems and other disadvantage. The briefing was prepared for Mr Andrews in response to an article in the Cranbourne Leader suggesting that transit police believed Sudanese men were responsible for 99% of assaults and armed robberies on two Victorian rail lines. The briefing, dated September 27, 2007, said: "Whatever the background of the perpetrators, it would be wrong to blame all people from a particular migrant group for the behaviour of a few." But a week later, Mr Andrews appeared to ignore its advice when he cited the failure of Sudanese people to integrate as a reason for cutting African refugee numbers. Yesterday Mr Andrews said the document was simply a departmental response to a news item. He said his comments were influenced by an Immigration Department dossier that raised community concern about African refugees forming gangs, fighting in nightclubs and attacking other families. "I wasn't blaming a particular group. I said we've got problems there and we need to do something about it." Despite the Darfur crisis in Sudan, Australia allocated just 30% of refugee places to Africans in 2007-08, down from 70% in 2004-05. But the race debate was not ignited until October 1 last year, when Mr Andrews was asked about the fatal bashing of 18-year-old Sudanese refugee Liep Gony in Noble Park. It later emerged that Mr Gony's alleged attackers were not African. Questioned at the time about whether better settlement services were needed, Mr Andrews said the refugee intake from places such as Sudan had been cut amid fears that some groups "don't seem to be settling and adjusting into the Australian life as quickly as we would hope". This was at odds with a media release he issued several months earlier saying the Howard government had changed the composition of its refugee intake because of an improvement in conditions in some African countries and the need to help Iraqis displaced by war and Burmese refugees living in camps along the Thai-Burma border. The Government was accused of playing "ugly race politics" on the eve of the federal election. Critics said Mr Andrews was "dog-whistling" to marginal outer-suburban electorates with large numbers of refugees. Mr Andrews said yesterday he had no regrets. "When difficulties are occurring, you can't put your head in the sand," he said. He had subsequently received supportive phone calls from Victorian police and visited migrant resource centres where he was told his comments were "entirely correct", based on their experiences. The Coalition had tried to deal with the issue by reducing - but not stopping - the African intake and providing an additional $200 million in resettlement services. Mr Andrews said he had read media reports a few weeks ago that police were working with the Immigration Department to try to deal with some of the problems. "I think what I did was bring to people's attention what was an issue and now something is getting done about it," he said. "If you remain without commenting on an issue, what would have been done?" Senator ELLISON (2.03 pm) - My question is to the Minister for Immigration and Citizenship, Senator Evans. As the minister is no doubt aware, the threat of people-smuggling in the region remains high. I refer the minister to his statement this week that 'from early 2008-09, people found to be refugees will receive a permanent visa, regardless of their mode of arrival'. Does the minister agree that this statement sends a clear message to people-smugglers that Australia's borders are open for business? Senator CHRIS EVANS - I thank the senator for his question, although I think it again indicates a worrying trend-that the Liberal Party are going down the path of fear and fear-mongering in the Australian community. Senator Ellison well knows that the Rudd Labor government remain absolutely committed to strong border security measures. We have made that very clear. We have maintained the excision arrangements; we have maintained the strong border security patrols by Defence, Customs and other law enforcement agencies; and we have continued to work very closely with the Indonesian government and other near neighbours on the issue of ensuring that people do not seek to sail to Australia in leaky boats, putting their lives at risk, and enter Australia unlawfully. Senator Ellison is also aware that, immediately on becoming minister, I went to Indonesia to have those discussions and to strengthen those relations. He is also well aware that, when he sought to do a similar trip, we provided as much support as we could to ensure that occurred, because it is important that we send the message to the region that there is a bipartisan approach from the government and the alternative government to strong border security and to deterring people from leaving to seek arrival in an unauthorised way in Australia, and to send a very strong message to peoplesmugglers that they ought not try to ply their trade. We have received great cooperation from the Indonesian government in fighting people-smuggling. There have been a number of really encouraging developments in that regard in recent times, including the arrests of a couple of people-smugglers and a lot of effective work in dealing with people-smuggling activities. There is no doubt that we still face the prospect of more unauthorised boat arrivals in coming months. This is the season for that activity to occur. There are huge pressures on populations of displaced persons throughout Asia and the Middle East. There is a potential population of people prepared to seek refuge who may embark on journeys with people-smugglers. What I announced this week was that we were abolishing the temporary protection visa regime. We are very proud of that, because it was an inhumane treatment of people found to be refugees by international legal principle. The previous government maintained a Pacific strategy-a means by which people were detained in foreign countries in camps designed to send the message that people could not enter this country unlawfully. It was a cruel and ineffective policy. Senator CHRIS EVANS - Well, that is interesting. When we abolished the Pacific solution, what did you say? Not a peep! None of you defended it. The shadow minister did not defend it. You snuck away because you knew it was wrong . Those of you of better principle knew it was wrong. I have not heard any of you defend the Pacific solution. Where have you been for the last three months? Hiding in shame! Senator Minchin - Mr President, I rise on a simple point of order. I ask you to request the Leader of the Government not to shout and yell in this chamber. I wonder if you could also ask the Leader of the Government to direct his remarks through the President and not directly across the chamber. The PRESIDENT - Senator Evans, I would remind you to address your remarks through the chair. Senator CHRIS EVANS - Thank you, Mr President. So the Liberal Party have failed to support the policy they supported in government and I took that as a good sign. But this question indicates that they are reverting again to cheap politics to try to demonise people, rather than try to develop a system that provides strong border security but humane treatment for those who the former government found to be refugees. From early 2008-09, people found to be refugees will receive a permanent visa regardless of their mode of arrival. Senator CHRIS EVANS - What I can guarantee is that there will be strong border security under the Labor government but more humane treatment of those who arrive. Is the shadow minister aware that, of the 11,000-odd TPVs his government issued, 9,800 or so eventually got full protection in this country? Of all the hundreds of people they put on Nauru, the vast majority ended up settling here. Their rhetoric was one thing; the reality was another. All the TPV regime did was make those people suffer with the uncertainty of their future for years. I brought an Afghan man, Mohammed, up here today. He was one of those people. For five years he was left to wonder what his future might be. For five years he was not allowed to travel, get settlement services or reunite with his family. That is what you presided over. We are very proud we abolished the TPVs, but we will maintain very strong border security.